2016 GMC Sierra 2500HD Denali LOCAL TRADE IN, CLEAN VEHICLE HISTORY REPORT, NON SMOKER, ONE OWNER VEHICLE, Allison 1000 6-Speed Automatic, 4WD, jet black Leather. Take a moment to stop by and see if this is the vehicle that best meets your needs. Located at 709 HWY 70 Bypass East in Goldsboro, directly beside Pizza Inn. Ask one of our trained professionals about a vehicle demonstration and test drive. 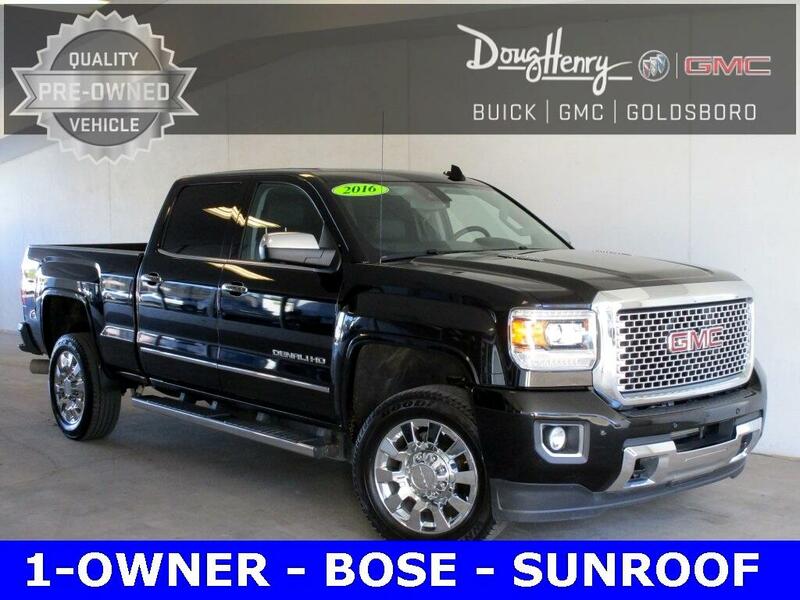 Duramax 6.6L V8 Turbodiesel 4D Crew Cab 4WD Odometer is 16042 miles below market average! At Doug Henry of Goldsboro we strive to make your car buying experience, simple, enjoyable, and straight forward. Every pre-owned vehicle pass through a 172 point inspection to ensure you have no worries with your next vehicle. We work hard to ensure every customer gets the best deal available. Competitive rates for customers with qualifying credit scores and credit rebuilding programs for those who may have had credit challenges in the past. Doug Henry of Goldsboro is here for all of your vehicle needs, from purchase to repair. Our qualified Service Department & Collision Center can keep your vehicle well maintained, and repair any damages in the unfortunate case of an automobile accident. Pre-owned vehicles have the remaining balance of original factory warranty if applicable. Service contracts are available for most pre-owned inventory. See dealer for details. Pre-owned vehicles are not guaranteed to have more than 1(one) key or key fob. Pricing shown is prior to Sales Tax, License Fees, and $638 Dealer Admin Fee. Proudly serving: Goldsboro, LaGrange, Kinston, Clayton, Smithville, Raleigh, New Bern.